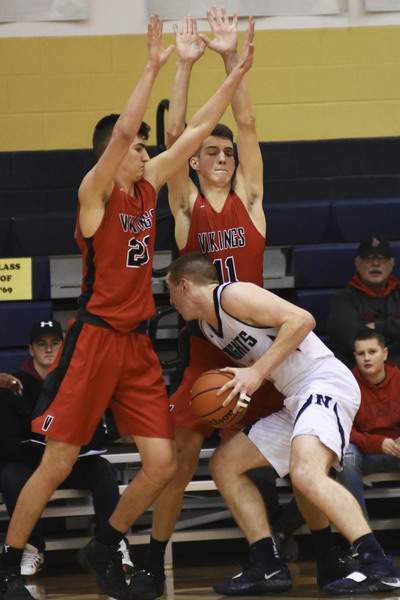 Katie Fyfe | The Journal Gazette Huntington North seniors Sawyer Stoltz and Hank Pulver block Norwell junior Will Geiger from taking his shot during the second quarter at Norwell on Friday. Katie Fyfe | The Journal Gazette Huntington North senior Sawyer Stoltz shoots the ball while Norwell junior Drew Federspiel tries to block his shot during the first quarter at Norwell on Friday. Katie Fyfe | The Journal Gazette Huntington North senior Sawyer Stoltz shoots the ball during the first quarter against the Norwell Knights at Norwell on Friday. Katie Fyfe | The Journal Gazette Norwell senior Levi Leidig shoots the ball while Huntington North senior Zach Daugherty tries to block his shot during the third quarter at Norwell on Friday. 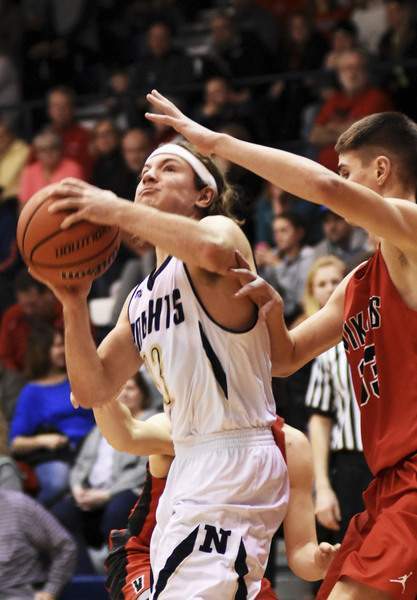 OSSIAN – For Norwell, the first half of Friday night's game against Huntington North went, in the words of coach Mike McBride, "about as bad as you can draw it up." 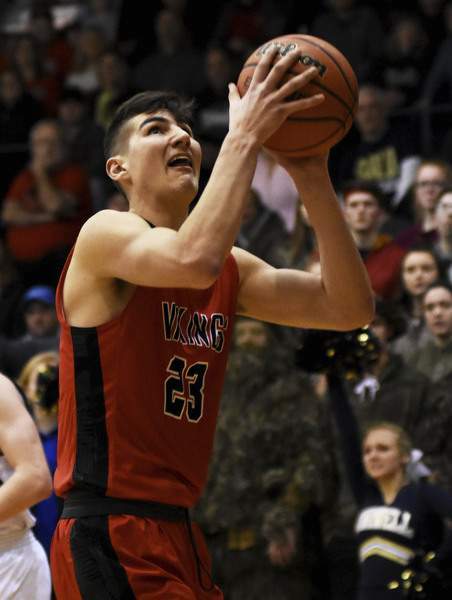 "We let them know at halftime, if we executed better on offense, we'd be up by 20," said Huntington North coach Craig Teagle, whose team led 18-0 before Norwell's Levi Leidig hit a 3-pointer and Will Geiger made two free throws to end the half. Norwell's Garrison Brege hit a 3-pointer to open the second half and pull the Knights, who had been tied with Huntington North for second in the NE8, within 10 points. 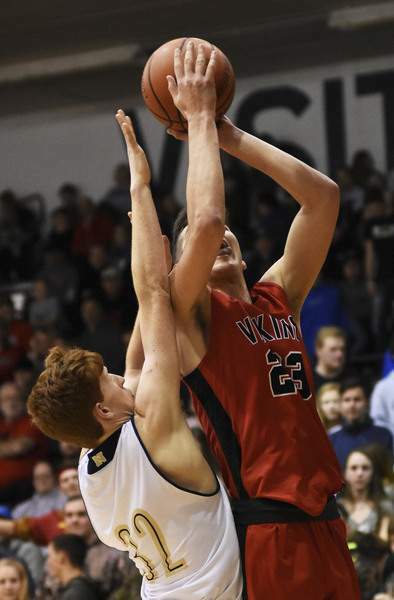 But Sawyer Stoltz, who scored 10 points for the Vikings (15-3, 6-1 NE8) in the first half, immediately followed up an old-fashioned three-point play on the other end. After that, the Knights (11-7, 5-2) were never able to close within 10 points. "We just weren't able to string enough stops together, and a lot of that was we were trying to trap here, and they were able to make that one extra pass and get a layup," McBride said. "Credit to them for being able to take care of the ball. We put ourselves in such a bad position that it made it hard for us to be able to come back where we needed to." "Geiger's arguably the best player in the conference, him and Ali Ali (of East Noble) are neck-and-neck, but he's relentless, so I thought Sawyer did a good job on him," Teagle said. "And everybody had to pinch and worry about trying to help in the post, which gave them some 3s that they knocked in. But I thought, overall, a pretty good defensive performance for us." Levi Leidig led the Knights with 10 points, and Brege and Geiger each finished with eight. "We talked to our guys, tried to get our guys to understand that we needed to be a little more patient offensively tonight, and I don't think we displayed that in the first half," said McBride, whose team shot 21 percent from the field, including 2 of 13 on 2-point attempts. "They did a good job defensively of coming out, they were very physical. They took away a lot of things that we try to do. They took away our cuts. They had a body on everything we tried to do, and got us a little out of our comfort zone." "We really wanted to win this one," Teagle said. "We feel like we're so much better than we were earlier in the year when we played East Noble, so we've really improved. But we knew it was going to be a tough contest." Friday's game was the first in a four-game gauntlet for Huntington North, which will play South Side at Huntington University today, Carroll on Tuesday and at Plymouth next Friday. "These next three games are really, really tough, so it was important to have a good start tonight, get off on a winning foot in this stretch," Teagle said.